Studying in Germany Multilingualism: yes! Everything in English: no! 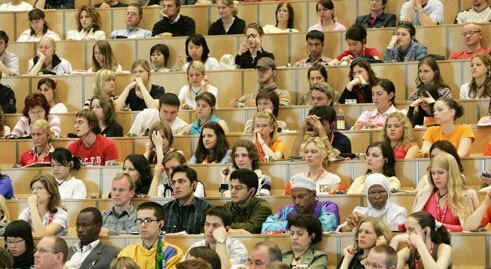 Never before have there been so many foreign students enrolled in German universities. After the UK, Germany is the most popular country in Europe for college students. Will that lead towards a "culture of multilinguism" at German universities? Studying in Germany is all the rage. Over 300,000 foreign students are currently enrolled in German universities and polytechnics (Fachhochschulen). Nowadays, in other words, one in ten students here are from abroad, which is a record high. These findings are presented in Wissenschaft Weltoffen 2014 (i.e. “Cosmopolitan Academia 2014”), a study carried out by the German Ministry of Education, the German Academic Exchange Service (DAAD) and the German Centre for Research on Higher Education and Science Studies (DZHW). Their report, drawn up every year based on student and testing statistics from the German Federal Statistical Office, shows that Germany is the fourth-most popular place to study in the world, surpassed only by the US, UK and Australia. The largest contingent of foreign students in Germany is from China (12.5 per cent), followed by Russia (5.3%) and Austria (4.2%). More than two-thirds of foreign students come to Germany to obtain a bachelor’s or master’s degree. Most of them study engineering, though laws, economics and social sciences are also popular courses of study. The figures show that diversity is alive and thriving in German higher education. But what are German universities doing to promote multilingual culture? At Ludwig Maximilian University of Munich (LMU), 22 different master’s programmes are taught in English. Together with the Munich International University Club, LMU organizes preparatory and language courses as well as outings and Welcome Days for foreign students to help them find out all about their new home away from home before their first term starts. Registered students can also take part in the so-called Buddy Programme, in which German students help foreign students get their bearings in Munich and actually accompany them to administrative offices to help them wade through the jungle of red tape. After all, that’s what buddies are for. All told, roughly 7,500 foreign students are currently enrolled at LMU, making up around 15 per cent of the total student body. “That’s a whole lot, which goes to show that our efforts are paying off,” says Dr Stefan Lauterbach, head of the Department of International Affairs at LMU. “Still, it is not our goal, as the TU München [Munich Technical University], for example, is planning to do, to conduct all our master’s programmes at some point in English only.” Lauterbach insists on the importance of German as a language of teaching and research, for English does not hold as much sway in every subject as it does in the natural sciences. “The use of German is quite justified in cultural studies and the social sciences, which is why we don’t want to take the line ‘English and there an end’– that’s not enough for us.” So LMU seeks to accommodate East European students, many of whom learn German as their first foreign language. Foto: TU Ilmenau/ari Multilingualism is the trend at some smaller universities, too, such as the TU Ilmenau in Thuringia. “We have four master’s programmes in English, they’re very much in demand,” says Dr Frank March, head of the TU Ilmenau International School. International demand is indeed booming, as can be seen from a walk around campus: 13 per cent of the students here have a foreign passport, representing a total of 70 different nationalities. “Most are from China, Russia and Syria,” says March, corroborating the results of the Wissenschaft Weltoffen 2014 study. Thuringia is popular and, along with Hessen, the German state that has succeeded in drawing the greatest number of new foreign students since 2008. That means an approximately 35 per cent increase. To bring all these nationalities together, Ilmenau has also launched a number of initiatives to integrate foreign students on campus, as well as to raise awareness among German students for their international classmates. One outstanding effort towards this end is the International Student Week in Ilmenau (ISWI for short). A students’ club of the same name organizes this world’s biggest international gathering of students every two years. Hundreds of international students come together in this town by the Thuringian Forest for ten days to present their various cultures at a number of events. “They do a better job of it than going the official track would,” says March with a laugh. Despite all this internationalism, March takes the same line as his colleague in Munich: “There is a basic policy: we shall remain a German-speaking university.” For he, too, sees German as an important language of teaching and research that should not be supplanted by English. 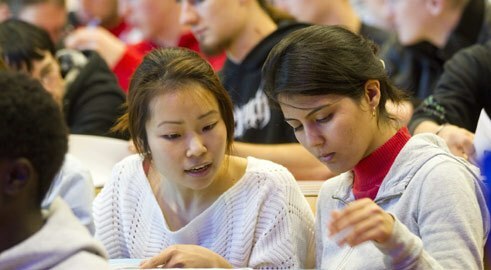 Consequently, in addition to expanding their English-language master’s programmes, Munich and Ilmenau are committed to the principle of “internationalization at home”, which means making it possible for Germans to experience internationalism – and hence, multilingualism – in their own country. Among other things, the idea is for all students to be able to learn additional languages at local language schools and for more and more of them to assist newcomers from abroad in projects like the Buddy Programme. Marieke Reimann is a freelance journalist covering sports, media and women’s issues, and a graduate of the Deutsche Journalistenschule (German School of Journalism).